Pearl is one of the oldest gemstones found and used by mankind. It is an organic gem produced by some molluscs (mostly oysters and mussels for commercial pearls). Pearls occur naturally in the wild when a grain of sand gets accidentally ingested by a mollusc. It will then produce nacre around the foreign object to protect itself and keep adding layers after layers. There are different varieties of Pearls depending on the type of mollusc producing them and the type of environment. Pearls produced using mussels in freshwater are called Freshwater Pearls. Pearls grown in oysters in the ocean are called Salt Water Pearls or just Pearls since they are the most common and the default ones. Natural pearls are very rare and are present in less than 1 percent of oysters making them impractical for any type of commercial operation. Fortunately nowadays most pearls are produced with the help of man. Those are referred to as cultured pearls where the process is artificially initiated by adding a small piece of mantle tissue inside the mollusc. This process can take from a few months to many years depending on where the pearl is growing (fresh or salt water), the species of oyster or mussel used and how big of a pearl is produced. The nacre growth rate varies from 0.3mm to as high as 5mm per year. 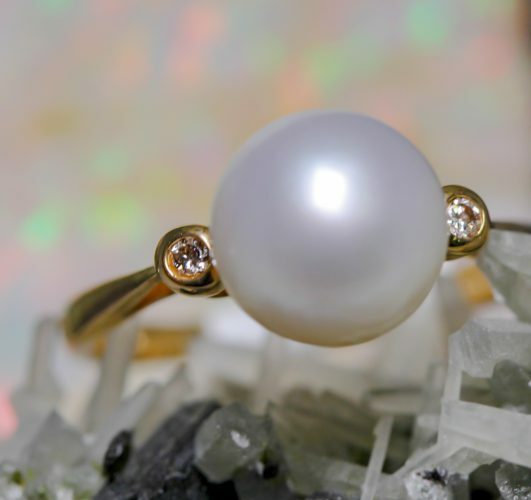 Pearls are very soft (3.5 to 4 on Mohs scale) and have to be treated carefully.